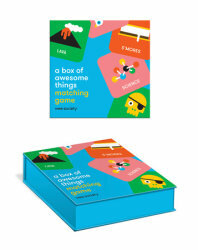 This 40 card box of ‘awesome things’ is a cute little matching game. It has uniquely designed pictures of helicopters, fireflies, even a plain white square. They are sturdy board cards so I expect them to have hold up well to little hands flipping them. My children and I all enjoyed breaking this open to play. On the downside, the sturdy box has a flip top with no way to secure it. Therefore, if it’s ever turned over or picked up by the wrong side you are picking up 40 cards. It would have been really helpful to have a Velcro closure. Also, the age range on the box is 3 years to 103 years. However, the names of the pictures are not words that children would really be able to read “camouflage” or “argyle” until they’ve mastered phonics. This did not stop my own 3 year old from enjoying it. I would certainly recommend this game or would give it as a gift. Clarkson Potter Publishing supplied a sample of this product in exchange for a fair and impartial review.